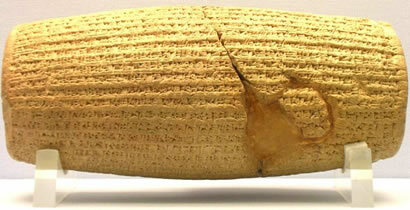 Cyrus the Great, Emperor of Persia issued a clay cylinder on which he decreed, arguably, the first ever human rights charter of the civilsied world. Now that I put the crown of the kingdom of Iran, Babylon, and the nations of the four directions on my head with the help of Ahura-Mazda, I announce that I will respect the traditions, customs and religions of the nations of my empire and never let any of my governors and subordinates look down on or insult them as long as I shall live. From now on, while Ahura-Mazda lets me rule, I will impose my monarchy on no nation. Each is free to accept it, and if any one of them rejects it, I shall never resolve on war to reign. As long as I am the king of Iran, Babylon, and the nations of the four directions, I will never let anyone oppress any others, and if it occurs , I will take his or her right back and penalise the oppressor. And while I am the monarch, I will never let anyone take possession of movable and landed properties of the others by force or without compensation. While I am alive, I will prevent unpaid, forced labour. Today, I announce that everyone is free to choose a religion. People are free to live in all regions and take up a job provided that they never violate others' rights. No one could be penalised for his or her relatives' faults. I shall prevent slavery and my governors and vassals are obliged to prohibit exchanging men and women as slaves within their own ruling domains. Such a traditions should be exterminated the world over. I implore to Ahura-Mazda to make me succeed in fulfilling my obligations to the nations of Iran, Babylon, and the ones of the four directions. 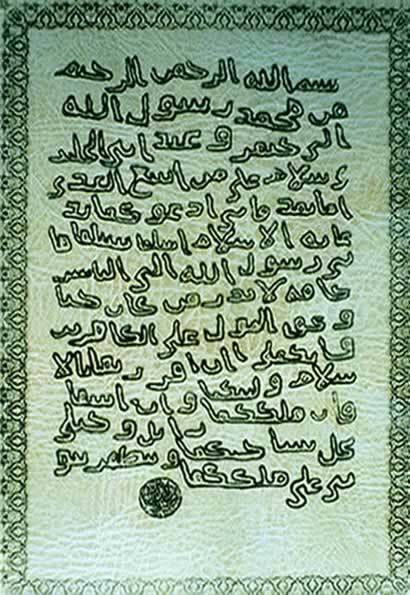 The following is the text of the ultimatum the Prophet Mohamad sent to Abd bin el-Julanda and Jaifer bin el-Julanda joint-rulers of Oman through the intermediary of his military commanders, 'Amr bin al-'As and Abu Zaid al-Ansari. In the name of Allah the compassionate, the merciful. 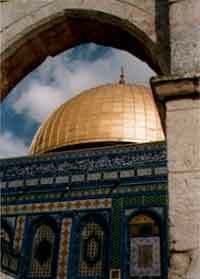 From Mohamed, messenger of Allah to Jaifer and Abd, sons of Julanda. Peace be upon the one who follows the right path! I call you to Islam. Accept my call, and you shall be unharmed. I am Allah's Messenger to mankind, and the word shall be carried out upon the miscreants. If, therefore, you recognise Islam, I shall bestow power upon you. But if you refuse to accept Islam, your power shall vanish, my horses shall camp on the expanse of your territory and my prophecy shall prevail in your kingdom. In the midst of wanton aggression, we yet call upon the Arab inhabitants of the State of Israel to return to the ways of peace and play their part in the development of the State, with full and equal citizenship and due representation in its bodies and institutions - provisional or permanent. We offer peace and unity to all the neighboring states and their peoples, and invite them to cooperate with the independent Jewish nation for the common good of all. To date only three states where Islam is the official religion have heeded this invitation and recognised the state of Israel. They are the Maldives, Egypt and the Hashemite Kingdom of Jordan. The Maldives withdrew recognition after the abolition of the monarchy and the end of the secular-leaning republican administration (1968 - 1978) that succeeded the monarchy. Most Islamic countries, with the notable exception of the Kingdom of Saudi Arabia and the Republic of the Maldives, tolerate certain non-Muslims. The terms of this tolerance, to this day, is based on the Pact of Omar. Muslims regard that discriminating against non-Muslims, as enshrined in the Pact of Omar, is an absolute right of Muslims. The irony is that the very same Muslims living in countries such as New Zealand, the United States, Great Britain and elsewhere regard that it is their inalienable right to be treated equally with other residents of these "infidel" states. Creaming off the best of both worlds appears to be reduced to a fine art. We shall not build, in our cities or in their neighborhood, new monasteries, Churches, convents, or monks' cells, nor shall we repair, by day or by night, such of them as fall in ruins or are situated in the quarters of the Muslims. We shall not teach the Koran to our children. We shall not take slaves who have been allotted to Muslims. We shall not strike a Muslim. Whosoever amongst us that strikes a Muslim with deliberate intent shall forfeit the protection of this pact. We accept these conditions for ourselves and for the people of our community, and in return we receive safe-conduct. If we in any way violate these undertakings for which we ourselves stand surety, we forfeit our Covenant, and we become liable to the penalties for contumacy and sedition. The President of the Republic has stated that Maldive nationals too must have the freedom to remain in a religion of their choice and that no group may be permitted to interfere with that freedom. 'Maldive nationals wish to remain a 100% Muslim nation' the President of the Republic said.....Should the religion that Maldive nationals choose be Islam then it is their right to remain Muslims. There ought to be no opportunity for any external elements to act in relation to that right. That is something that neither our religion nor international principles permit. The President of the Republic said that Islam is the religion that was sent as a mercy unto mankind by the noble Allah and it is the most noble religion.